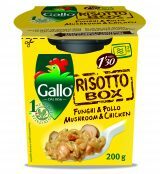 “RISOTTO BOX“, a practical and innovative way to enjoy an authentic, creamy “al dente” Italian Risotto in just 1 min 30 secs. Quick and easy to prepare, in the microwave, without adding water, it’s tasty everywhere. NO artificial colourings, NO hydrogenated fat, NO MSG.